Well I’ve had a little time to think about the MSSC Desalination Summit in Las Vegas Jan 16-18. I asked the same kinds of questions at this meeting as I did last August at the annual American Membrane Association conference. The effect was almost the same. Almost — but not quite. Patricia Mulroy, General Manager of the Southern Nevada Water Authority communicated the urgent need for action over the next 10 years. Also, it seemed a few of the guys at the conference caught a glimmer of what I was getting at. Also, I had the impression that the Bureau Of Reclamation is moving toward taking a bigger role in water desalination research. During one of the Q&A’s I mentioned that the Australians had responded to their drought by appropriating 250 million over 7 years to cut the cost of water desalination in half. What I didn’t mention was that their confidence that they could do so — came in part from American research. The announcement that they were going to appropriate 250 million for desalination research came four months after a visit by LLNL scientists to Australia to show how their carbon nanotubes could desalinate water without energy intensive pumps. Fresh water just passed through their membranes. That story was printed in every provincial Australian newspaper. In the USA that story never made it out of the science journals. Pat Mulroy mentioned the relationship between energy and water. Everyone in desalination knows about this but nobody else does. It would be very helpful if Nevada people especially could be buttonholed to finance three sets of commercials for the Washington DC TV market–that made the link between water and energy. As well, a link should be made between the effects of climate change on the water supplies in the west, the southeast and even in the northeast. As mentioned in the conference even New York City has begun to think of the effects of sea water intrusions into their pristine water supply. The point is that climate change and population growth are not a regional problem. Finally a commercial for the Washington DC market should emphasize that the water solutions of the New Deal are no longer adequate for the growing populations and climate change that characterize the 21st century. The future is not what it used to be. These commercials would run for a year. As mentioned in the Thursday morning Congressional Video Link Up–Washington staffers and congressmen know precious little about the desalination business. Therefor they don’t understand the link between energy research–for which there is a great deal of money available–and water desalination research–for which there is precious little money available for research. Some commercials establishing the link would make selling the link easier–and thereby ease the task of obtaining R&D funding. He promised to make the U.S. oil independent within five years.The Senator says he’ll make it happen quickly, with a program like the Manhattan Project. That was the big push the U.S. made to build an atomic bomb before Germany could get one. Notice the reference to the Manhattan project and the Moon Shot. advocates increasing federal investments in energy, materials science, automotive technology and fuel technology from $4 billion a year — its current level — to $20 billion a year. Why the the reference to war time projects like the moon shot and the manhattan project? And why have the time frames been shortened to 5-10 years? Its not just environmental or national security concerns. Now even big oil is buying into the peak oil argument. Shell Oil CEO Jeroen van der Veer this week wrote “Shell estimates that after 2015 supplies of easy-to-access oil and gas will no longer keep up with demand.” That means that unless crash programs are enacted to bring down demand for oil–especially in the USA–oil prices are going to the moon. One way or the other a radical rewrite of the energy picture is coming. The picture of Hoover Dam tells pretty much the same story for water–and in the same time frame. Supplies are not keeping up with demand. Mike Hightower of Sandia Labs mentioned on Thursday that alternative energy over the next couple years would become more economical than traditional energy sources. He said something similar happened to desalinized water 10 years ago. After the American Membrane Association meeting last August I proposed spending 3 billion over 7-10 years– to research ways to collapse the cost of water desalination and transport so that desert water costs nearly the same as east coast water… And the east and gulf coasts would have a new source of cheap fresh water. In the context of current presidential campaign promises–my numbers now don’t seem so extravagant. Its remarkable how water and energy production go hand and hand across several fields. 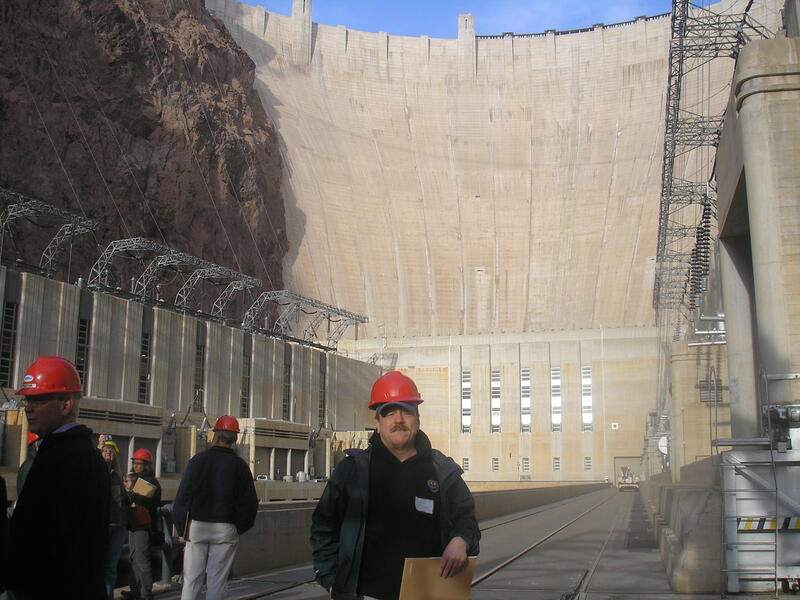 The Hoover Dam produces both power and water. Waste heat from power plants on the coast will be used for desalination. The same is true for research. imho the primary targets for for desalination research: catalysts and semipermeable membranes are the same for hydrogen production. It may well be that both will see a need for smart pipelines. 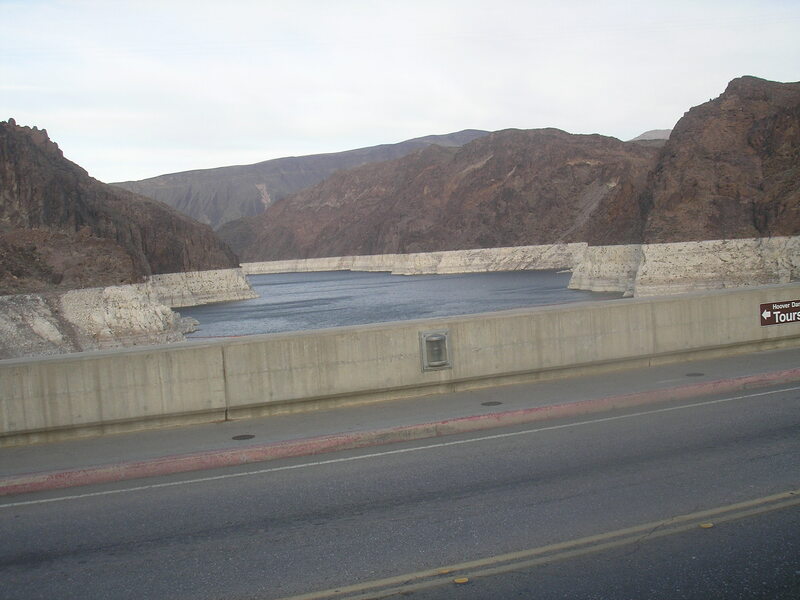 These are things to consider as the water levels fall behind the Hoover dam. With water levels down officials are also considering the effects of water being so low the electrical generators may have to be shut down. Looks like there will be a good snow pack this year in the Sierra Nevadas and the Rockies. If all goes well that will add one foot to lake levels. That’s a good year. But not so much when you consider that the lake is down 120 feet. At the conference we learned that current climate models in the southwest call for three in ten years as being good for precipitation. It used to be seven in ten years. The point of the piece was that sometime in the future California public utilities might be able to offload a part of their energy costs for pipeline pumping–by using net metering. Along the way I mentioned that photo voltaic companies like NanoSolar would be collapsing the cost of solar power. This past December NanoSolar made good on their promise. Nanosolar (as recorded in Popular Science Magazine) is now producing solar cells for about $1 a watt. That’s their sales price. Their manufacturing cost is $.30 @ watt. It costs another $1@watt to plug in all the pieces for the solar panel. To understand these numbers its helpful to understand that the cheapest way to produce electrical power currently is by coal and that comes to $2.1 a watt–plus transportation and clean up. Once full production starts this year, Nanosolar’s plant will create 430 megawatts’ worth of solar cells a year—more than the combined total of every other solar plant in the U.S.–and about the output of a medium sized coal plant. All production is booked for the next 18 months. Its easy to see that photovoltaics at Nanosolar price points will make it easy to get financing to scale up to 50-100 plants just like the one now in production. Anyhow this is a good read at the NY Times. Judging by the research — photovoltaic costs will fall much further in the next couple years. So how can the desalination community push down the cost of desalination — at the kinds of lightning strike speeds that solar power enjoys currently? Next week, I’m going to the annual MSSC Salinity Summit in Las Vegas. The last time I was in Vegas — was last August — for annual meeting of the American Membrane Technology Association. After that meeting last August I proposed spending 3 billion over 7-10 years– to collapse the cost of water desalination and transport so that desert water costs nearly the same as east coast water. Basically, the research today strongly suggests that it will be economically possible to make water desalination and transport so cheap that in the not distant future –it will be economically possible to turn all deserts green. The White House Office of Science and Technology Policy (OSTP) released a study (entitled A Strategy for Federal Science and Technology to Support Water Availability and Quality in the United States September, 2007) on the national challenges to ensure adequate fresh water supplies. The study then outlines a federal strategic plan for addressing these challenges and provides a guide for how federal agencies will be a part of this plan. The study names the Dept of Interior’s Bureau of Reclamation Science and Technology Program as one that funds both internal and external desalination research. I would think that this agency might perform the role of orchestrating research funding by multiple public and private entities toward multiple desalination research projects. Certainly someone needs to do this. There are a lot of public and private groups currently funding desalination research. However, I would think that if the water desalination community wants to go into high gear — then they need to adapt the practices of fast moving industries. What that means is that the front line scientists choose the research projects and the administrators work out the funding. This is done by way of crowd prediction markets. ie how does a research administrator best deploy his dollars between projects competing for research dollars? Choosing rightly between known knowns is difficult. In fast paced industries companies use something called prediction markets. I discuss this strategy here. Besides all the various agencies currently funding research– some mention needs to be made of the National Nanotechnology Initiative. The National Nanotechnology Initiative spends two billion dollars annually. Their 2007 Strategic Plan named Safe Affordable Water (page 27) as a strategic goal. This will make a considerable amount of money available for Membrane R&D and Manufacturing. Consider last years big LLNL carbon nanotube membrane breakthrough. That work was not funded through the NNI. It was funded from LLNL’s LDRD program, DARPA, & NSF. With NNI funding –much more desalination membrane work like the LLNL initiative will be eligible for funding. Prize money like the X-Prize is a frugal way to get the most bang for the research buck. I blogged about this in a piece called harvesting research unknown unknowns. Develop an inland desalination operation and disposal system (for water) in rural, isolated communities to demonstrate a low-cost, simple and reliable system. A more sophisticated version of the same thing could be done for membranes, pipelines etc. Another suggestion would be to attack known unknowns by employing a much less publicized method of crowd sourcing scientific research which I discuss in detail here. Often a research organization will have the right questions but limited time, budget or brain power with which to solve the problem. Wouldn’t it be nice to say “Ok we have this problem and we will pay this much for a solution.” Websites have grown up to address this problem. Next Wednesday USBR is sponsoring a trip out Hoover Dam. Its a helpful thing to consider men whose vision made the 20th century possible in the southwest and whose vision today continues to buy time for many desert communities.